Former Chairman of Kumasi Asante Kotoko, Herbert Mensah has donated a variety of food items and cash to a cross section of Kumasi families who lost their relatives in the May 9, 2001 stadium disaster. 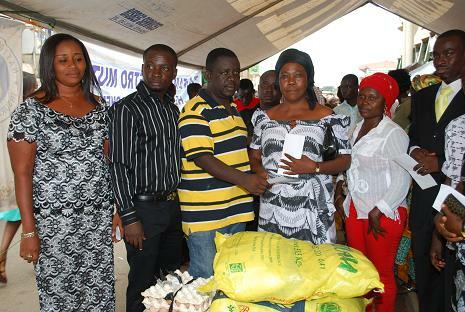 The items including bags of rice, crates of eggs, cartons of milk, vegetable oil and an undisclosed cash amount were presented to nine different families in the Kumasi metropolis. Speaking on behalf of Mr. Mensah who is out of the country, Mr. Sometymer Otuo Acheampong consoled the families and prayed that they take good care of dependents of the departed ones. “I know it is always difficult to get over a traumatic experience such as what happened to your brothers and sisters; husbands, fathers and mothers”. Mr Acheampong said. He assured the families of the commitment of Mr. Mensah to always remember and offer whatever assistance he could offer at all times to the bereaved families.” He (Herbert) would always assist in his small way to assist you as long as he lives,” Otuo Acheampong conveyed the message on behalf of Mr. Mensah. Speaking on behalf of the beneficiaries, Mama Bissi who lost her husband on that fateful day expressed the heartfelt appreciation of the families to the continued exhibition of love and care by Mr Mensah. The beneficiary families were unanimous in their view that the government must support Mr. Mensah in his laudable venture of seeking the welfare of the dependants of the bereaved families.